In 2006, the Eguren family took their generations-old tradition of making apple cider to a new level, offering the guests at their agriturismo the experience of the wonderful nectar that came from their orchards on the property. And five years later, the gracious praise of their fans inspired them to expand towards the seriousness of their hobby, with the addition of some extra land and some extra apples from their neighbors. 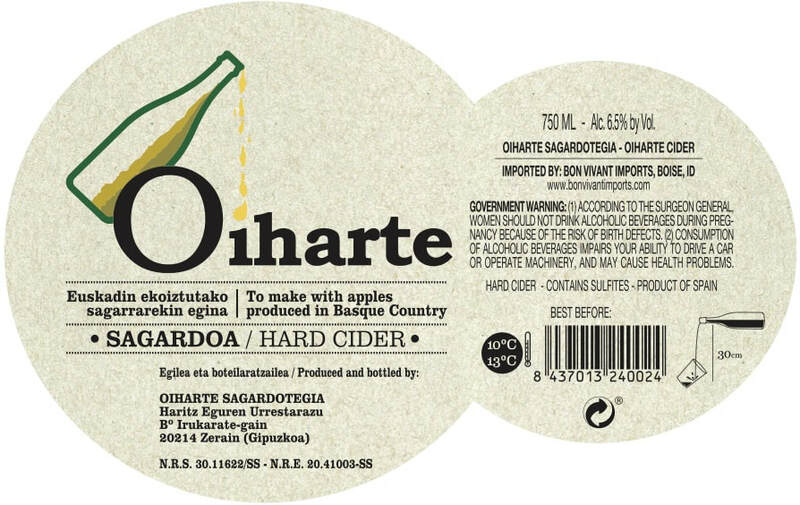 At that time, they created Oiharte Sagardotegia to make and sell cider for all who may want it. Located in the town of Goierri in Zerain, high in the north of Spain in Gipuzkoa-Euskadi (Basque Country), this lovely estate is farming organic apples in order to make traditional, bone-dry, Basque Cider. Haritz Eguren now fully dedicates his time to his passion of family tradition, obtaining a perfect blend of healthy local apples that never see the addition of chemicals or pesticides, in order to make his cider. 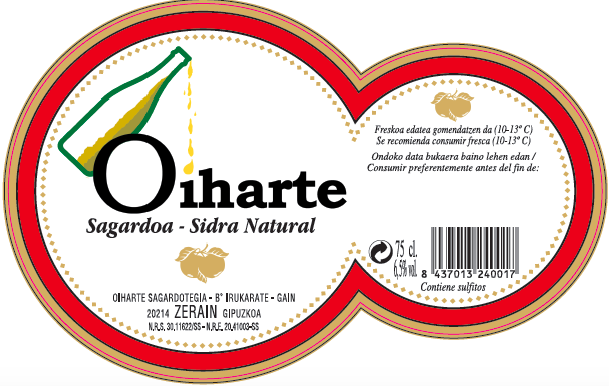 The Oiharte Sidra Natural is a blend of only three types of apples, compared to a mix of dozens of varieties that are allowed. This gives a purity and focus to the Oiharte ciders that is not always easy to find. Errezila, the most popular Basque apple for cider production, is predominately used because of its sharpness and its sweetness, and is accompanied by Urtebi (very tart) and Txalaka (sour and sweet) apples to give depth of flavor and complexity, while still remaining true to their piece of land. All the apples are gathered by hand, brought into the production room, washed, sorted (rotten apples are discarded), and crushed for juicing. Fermentation in stainless steel takes place for anywhere between 2 and 4 weeks, and bottling (without filtering) can begin in January and last up until the next harvest. The juice is dry, funky, fresh, and distinctly Basque in character, and is traditionally paired with cod omelets and thick cuts of beef, but it can taste incredible alongside so many types of various cuisines. The Oiharte Euskal Sagardoa is a particularly labeled bottle of cider from the Basque Country in Spain. The Euskal (Basque) Certification label guarantees that the apples are from the Basque Country, that the apples are within the acceptable list of allowed varieties, and that the quality of the finished product is of a particular level in the chemical analysis, as well as in regards to the visual, aromatic, and taste of the finished cider. Oiharte is allowed to add yeasts for fermentation, however this is done completely naturally in stainless steel with a strategic blend of apples for the desired result. The Errezila, Urtebi Txikia, and Txalaka apples are meant to give plenty of acidity to the blend, while the Moko apples are for bitterness, and the Gezamiña apples are for sweet tones; all together forming a balanced palate that offers these elements, along with the characteristic dry funkiness of ciders from this part of the world.